This easy recipe for Argentinian-style baked chicken empanadas will show you how to make savory hand pies that the whole family will love. Your kids will enjoy this delicious South American comfort food at lunch or dinner. Plus, you can make it ahead or freeze for later! 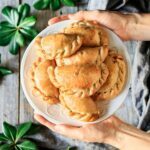 Have you ever tried an empanada? 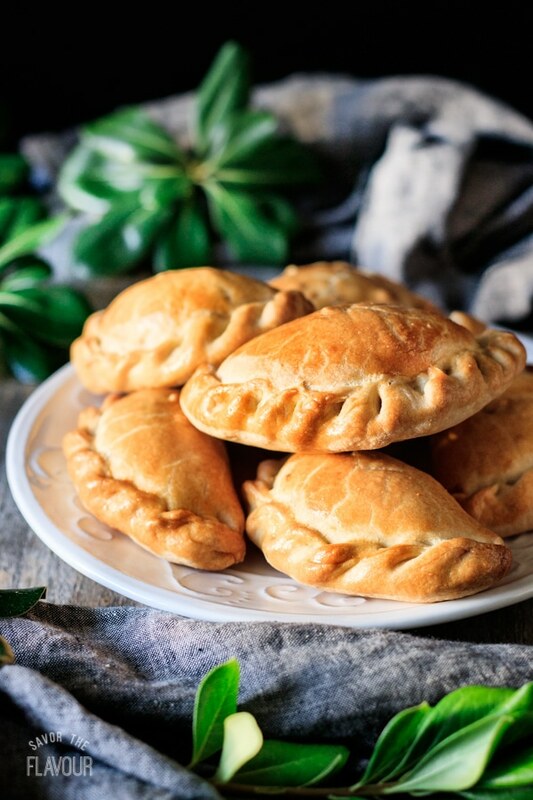 These flavorful savory pastries are a special treat that you need to make. 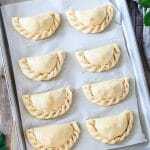 These Argentinian-style baked chicken empanadas can be made ahead or frozen, so they’ll be ready anytime! 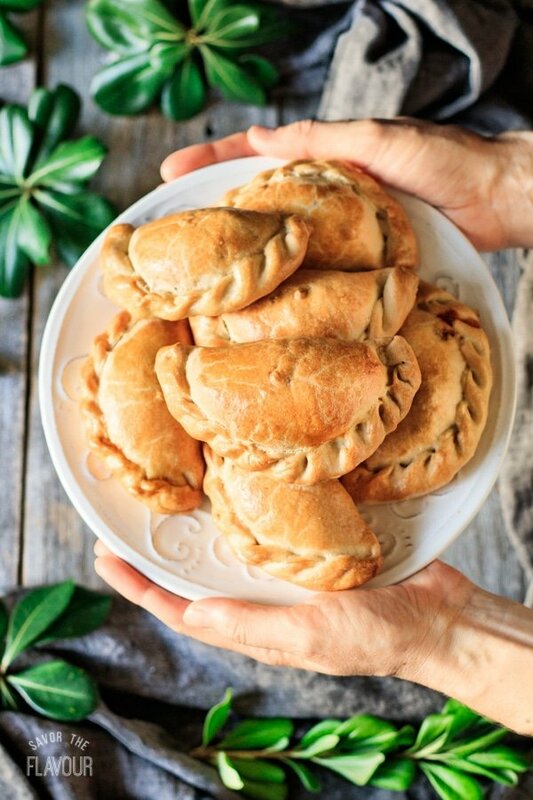 Empanadas (pronounced emp-ah-NAD-ahs) are actually from Galicia, a region in northwestern Spain. Their name comes from the Spanish verb empanar, which means “to wrap in bread.” The rope-like crimped edge is called the repulge. 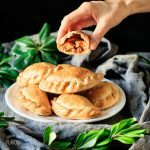 What are empanadas filled with? Empanadas can be filled with almost anything. Traditionally, they are stuffed with a savory filling such as beef, chicken, fish, or cheese. Nowadays, people also make sweet empanadas filled with fruit. Absolutely! 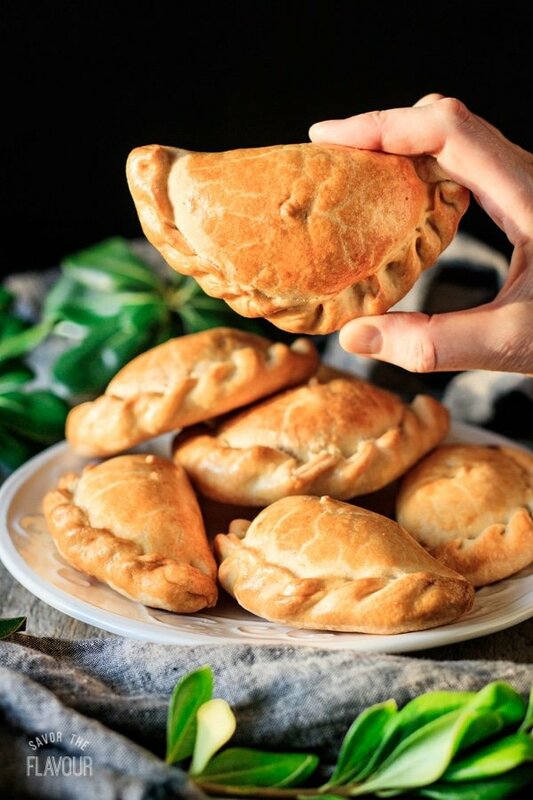 Empanadas can be deep-fried or baked–whichever you prefer. These chicken empanadas are baked, which is easier and healthier. 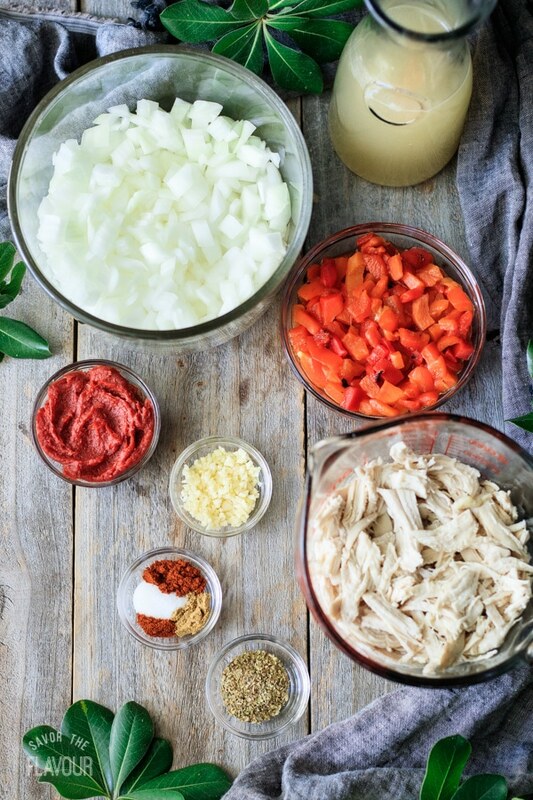 Prep all the ingredients by shredding the chicken, chopping the onions and roasted red peppers, and mincing the garlic. Cook the onions until soft, then add the garlic and cook for another minute. 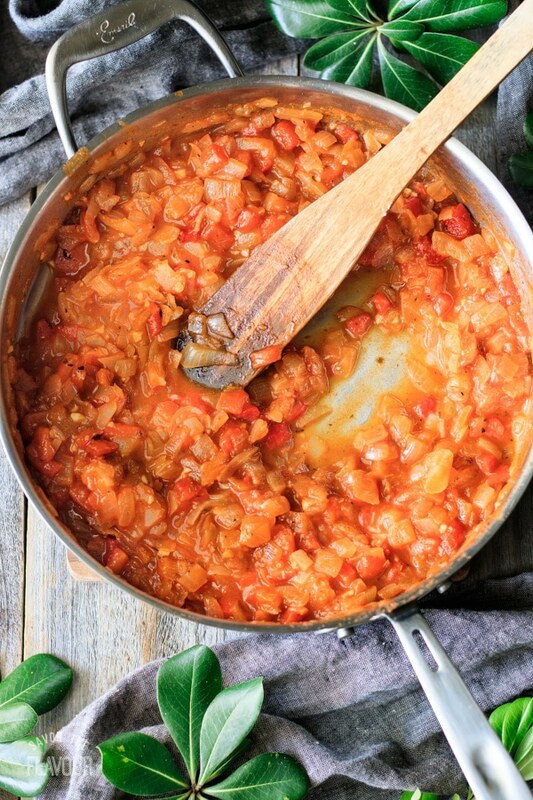 Stir in the roasted red peppers, tomato paste, and spices. Add the chicken broth, bring to a boil, and let it cook until almost all the liquid has evaporated. 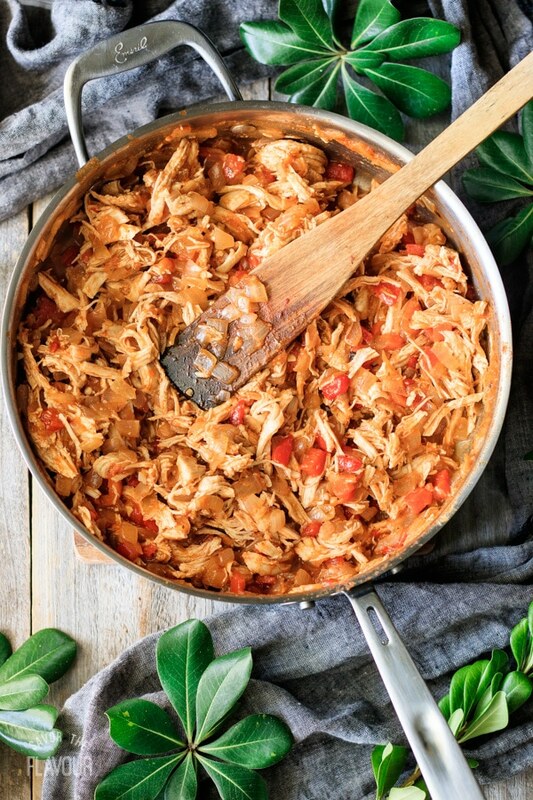 Stir in 2 tablespoons of lime juice and the shredded chicken and set aside to cool. 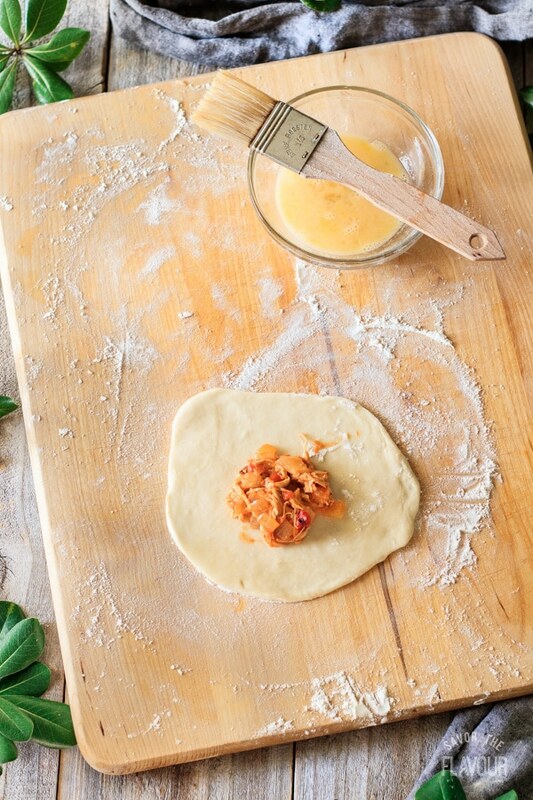 Divide the empanada dough into 16 pieces and roll them out into six-inch circles. Place 1/8 cup of chicken filling in each empanada and brush the edges halfway around with beaten egg. Fold the dough over and pinch the edges tightly to seal. Crimp the edges with a fork or with your fingers (see the recipe card below for instructions). 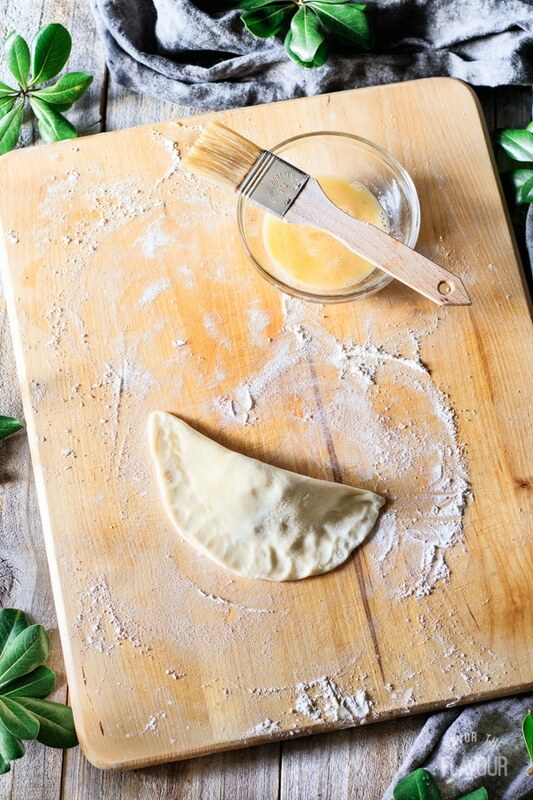 Brush each empanada with beaten egg and cut two small vent holes in the top. Bake at 375 F for 35-40 minutes, until golden, then let them cool on a wire rack. Taste the cooked filling and adjust the seasonings as desired; make it spicy if you want! Can I substitute all-purpose flour for the bread flour? Yes, you can; just realize that the dough won’t be as strong and chewy. Bread flour contains more gluten than all-purpose, and strengthens the dough. Make the filling and empanada dough up to 3 days ahead of time. Freeze unbaked empanadas on cookie sheets, then transfer to a zip-top freezer bag and freeze for up to 3 months. 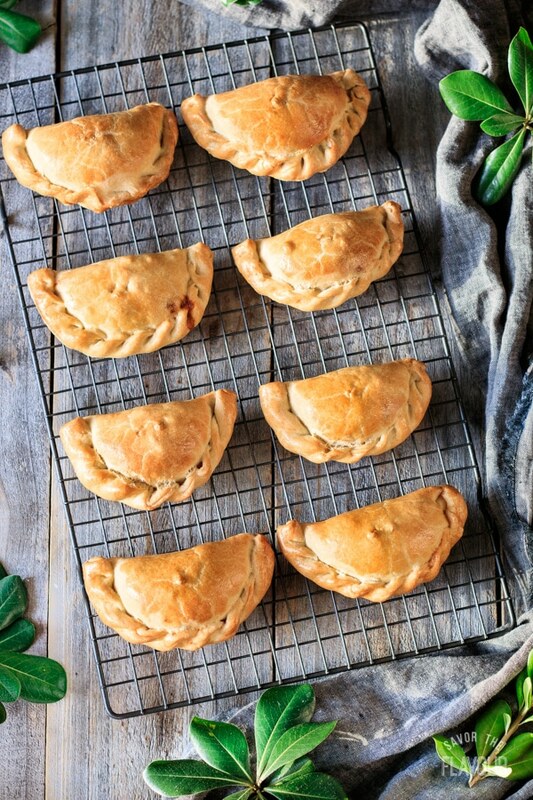 Bake the frozen empanadas straight from the freezer–no need to defrost. Don’t miss out on these other delicious chicken pies! Chicken Sausage and Pepper Pie: get ready for a flavor explosion with this healthy, Mexican-inspired pie. 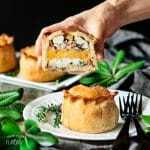 Chicken, Bacon, and Apricot Pies: impress your family and friends with these gourmet chicken pies. 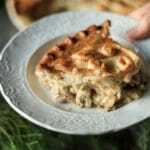 Creamy Chicken and Mushroom Pie: warm up from the inside out with this easy comfort food pie. 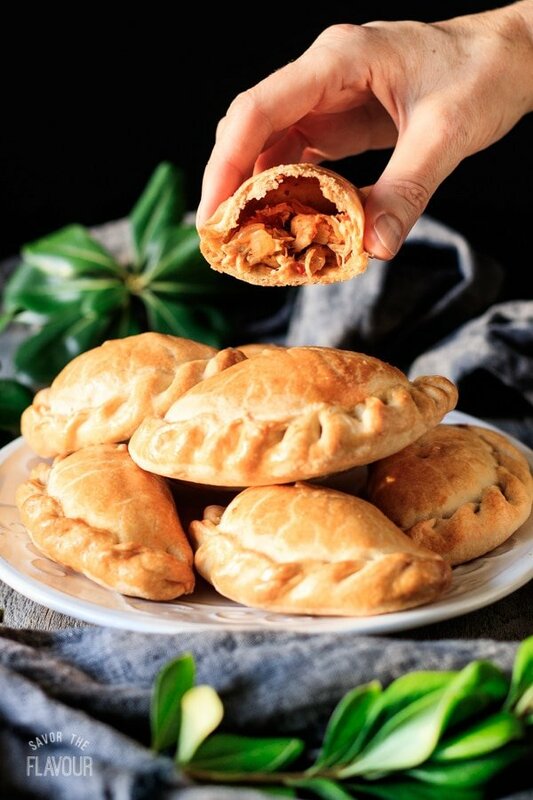 Share how you enjoyed these chicken empanadas by leaving a recipe rating below. Place the bread flour, lard, and butter in a medium mixing bowl. Rub the fats into the flour by pinching them together and fluffing the mixture with your hands until evenly blended. Add the salt, sugar, and half of the water and stir with your fingers. Gradually add more water as needed to create a moist, but not sticky, dough. Make sure all the flour is picked up from the bowl. Knead the dough several times to finish blending the ingredients together. Split the dough in half, shape into discs, and wrap tightly with plastic wrap. Chill in the fridge for 1 hour. Chop the onions and red peppers and mince the garlic. 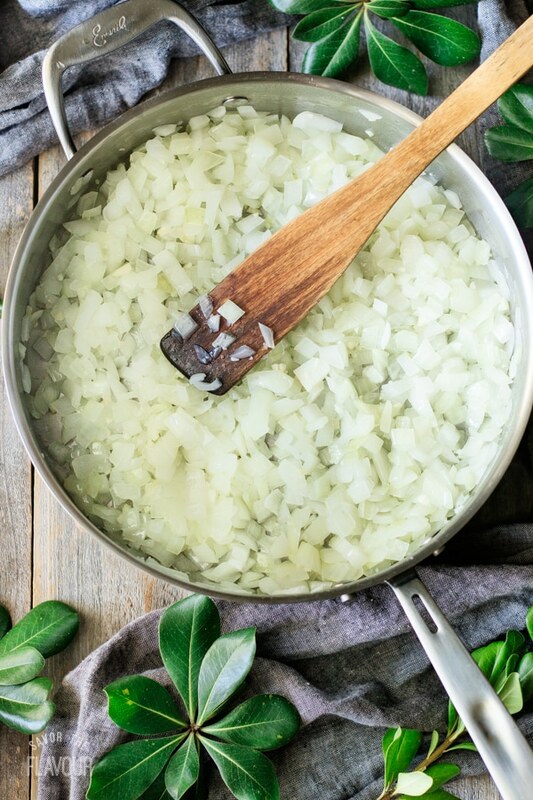 Heat the olive oil in a 10-inch skillet over medium-high heat, then add the onions and cook until soft. Add the garlic and cook for a minute more, until fragrant. 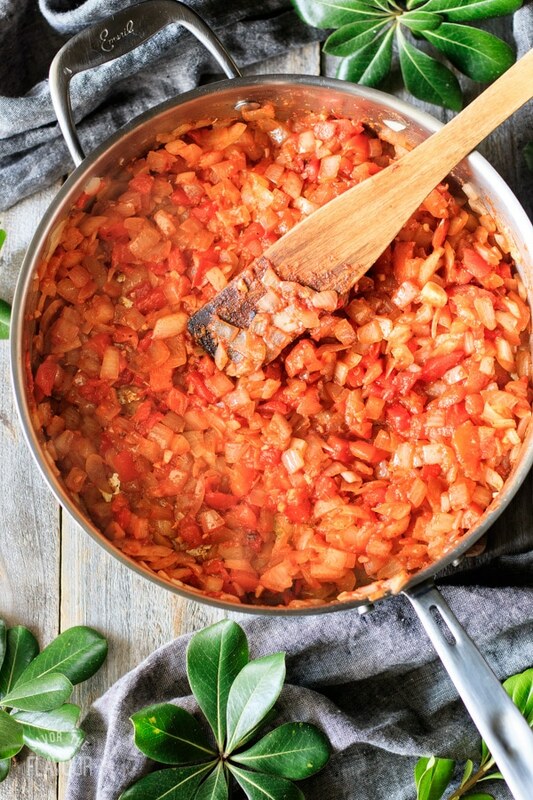 Stir in the roasted red peppers, tomato paste, and spices until well mixed. Pour in the chicken broth and bring to a boil over medium heat. Cook uncovered for 10-15 minutes, until most of the liquid is gone. Stir in the lime juice and shredded chicken and remove from the heat. Taste and adjust seasonings as desired. Preheat the oven to 375 F. Line two 11 by 17-inch cookie sheets with parchment paper. Beat an egg in a small bowl until well blended. 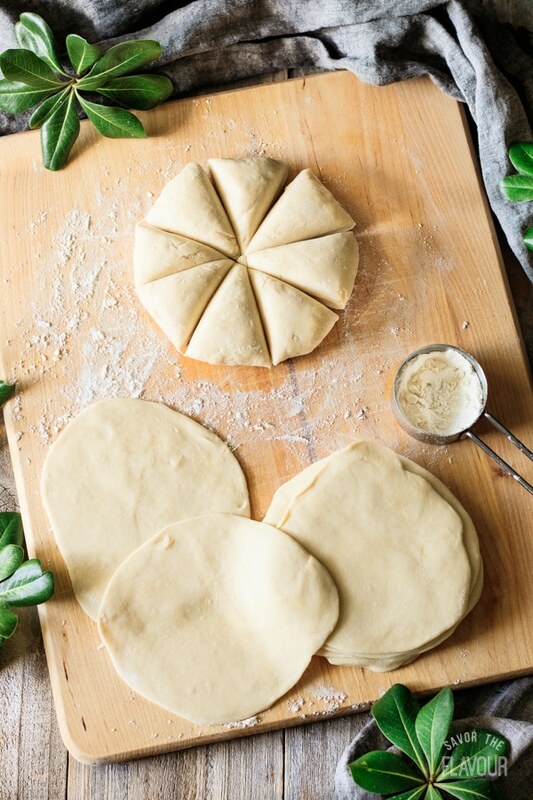 Divide each disc of dough into eight pieces. Roll each piece of dough into a ball, then roll it into a six-inch circle with a rolling pin. Place 1/8 cup of the chicken filling in the center of the circle. Brush the edge of the dough halfway around with beaten egg, then fold the dough over to create a semicircle. Press the edges firmly to seal. Crimp the edges with a fork or with a rope pattern. 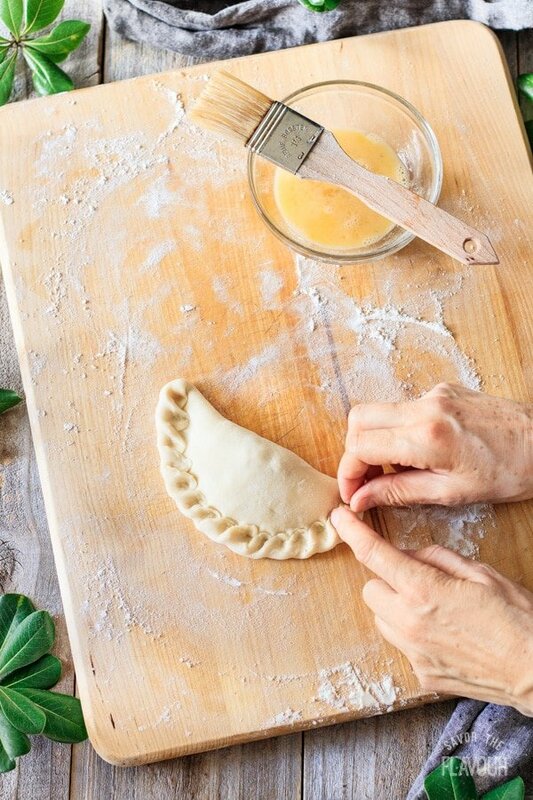 To make the rope pattern, place your left index finger at one end of the empanada. Using your other hand, grasp the dough right beside your index finger and pull it up. Then, place your left index finger on the pulled-up dough and repeat. Pinch off any extra dough at the other end. You can use this to make an extra empanada. 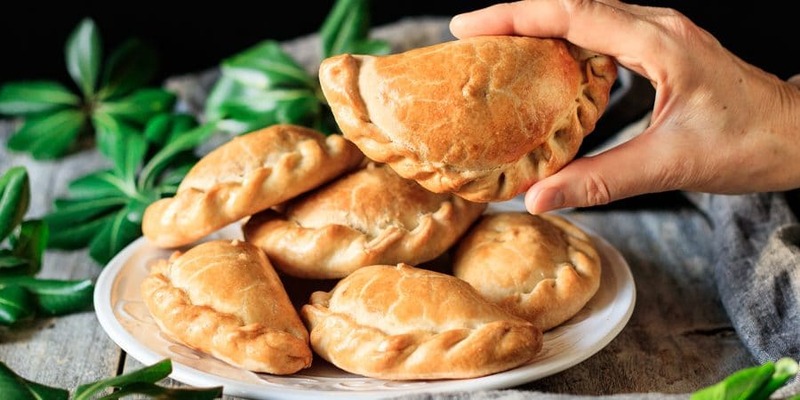 Place eight empanadas on each tray, then brush them with beaten egg and cut two small vent holes in the top with a knife. Bake the empanadas at 375 F for 35-40 minutes, until golden brown. Rotate the trays halfway through for a more even bake. Let the empanadas cool on wire racks for 20 minutes before serving. Both the empanada filling and dough can be made up to 3 days ahead. 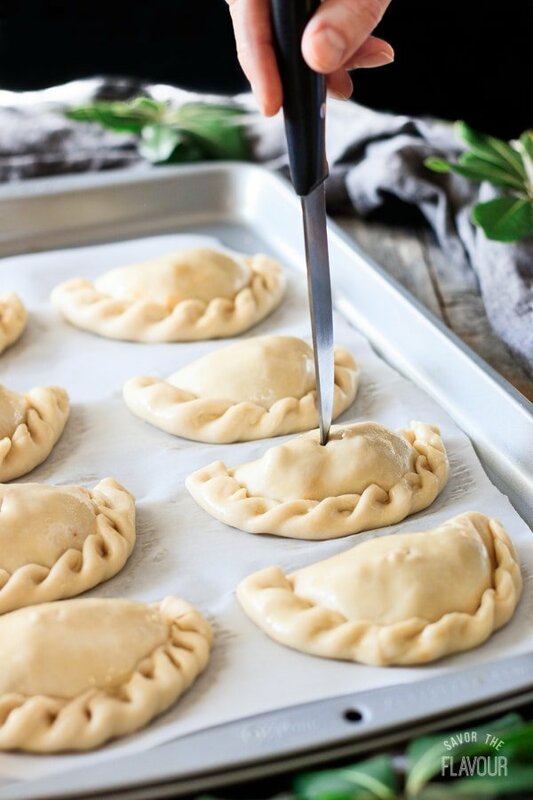 Unbaked empanadas can be frozen on cookie sheets, then placed in zip-top freezer bags and frozen for up to 3 months. Eat any extra filling in a tortilla, or use it to make another batch of empanadas. I dying to make my first empanada. Your recipe calls for a bread flour. Can I make the dough with unbleached flour? I am looking forward to making them. Yum!! I’ve only made empanada dough with bread flour. Since all-purpose flour (bleached or unbleached) contains less gluten than bread flour, the dough won’t be as strong and chewy. Feel free to substitute the bread flour with all-purpose–it’s just that the dough won’t be exactly the same. 🙂 Hope this helps!